Anchor: Following her arrival back in South Korea from the U.S., Foreign Minister Kang Kyung-wha has moved to dismiss speculation that Seoul is looking to ease sanctions on Pyongyang. Meanwhile, the nation’s top national security adviser Chung Eui-yong has also returned from the U.S. following what he called “very useful” discussions on how to push forward on Washington-Pyongyang nuclear talks. 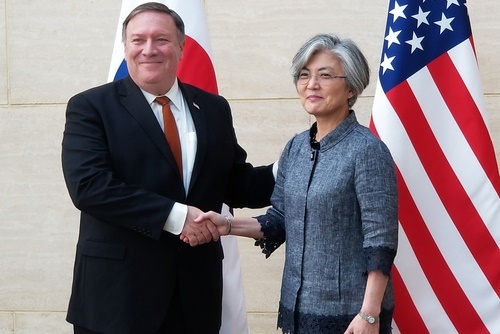 Report: Foreign Minister Kang Kyung-wha returned from her trip to the U.S. Monday after meeting with U.S. Secretary of State Mike Pompeo and stressed that South Korea has no plans to ease international sanctions on North Korea. Kang spoke to reporters to dismiss media speculation that she emphasized the need for easing sanctions during her meetings with U.N. Security Council members. The minister said that she only sought some exceptions from the sanctions, which are needed for inter-Korean projects. On Sunday, the nation’s top national security adviser Chung Eui-yong said that he had “very useful” discussions during his U.S. trip on diverse ways to help push forward on Washington-Pyongyang nuclear talks more speedily. Chung met with his U.S. counterpart John Bolton on Friday in New York and the two sides reaffirmed that they would pursue their common goal of the North’s denuclearization to establish peace on the Korean Peninsula. He added that to achieve the objective, Seoul and Washington have also agreed to share related information and maintain close cooperation based on their solid alliance. 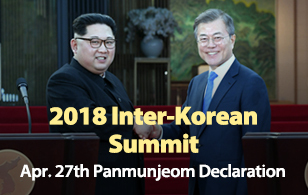 Meanwhile, North Korean media have urged the South to make active efforts to declare an end to the Korean War in line with the Panmunjeom Declaration. The North’s propaganda Web site Uriminzokkiri said on Monday that South Korea should not just sit idly and watch the U.S. refusing to declare an end to the war. Another North Korean Web site Meari called on the Seoul government to embrace its role in adopting a statement to declare an end to the war. The site claimed that Washington is making unilateral demands on the North’s denuclearization without showing sincere efforts to declare an end to the war due to South Korea’s lack of action on the matter. David Kim, KBS World Radio News.